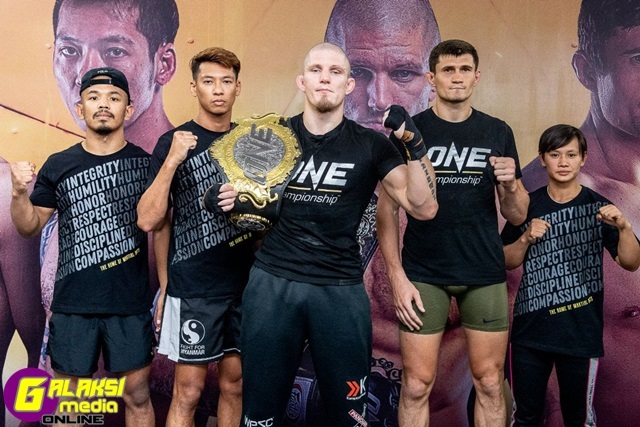 5 March 2019 – Yangon, Myanmar: The largest global sports media property in Asian history, ONE Championship™ (ONE), recently held the official ONE: REIGN OF VALOR Open Workout at the Transcend Gym last Tuesday, 5 March, featuring main event competitors Zebaztian “The Bandit” Kadestam of Sweden and Georgiy “Knight” Kichigin of Kazakhstan. Also in attendance were ONE Athletes and hometown heroes Phoe “Bushido” Thaw, “The Dragon Leg” Tial Thang and Bozhena “Toto” Antoniyar. All athletes are set to compete at ONE: REIGN OF VALOR, which takes place this Friday, 8 March at the iconic Thuwunna Indoor Stadium in Yangon, Myanmar. ONE Welterweight World Champion Zebaztian Kadestam of Sweden will defend his World Title against Georgiy Kichigin of Kazakhstan in the main event. In the co-main event, Phoe Thaw of Myanmar returns to action to face “The Iceman” Yohan Mulia Legowo of Indonesia. Tial Thang of Myanmar squares off with Cambodian Kun Khmer practitioner Rin Saroth, while Bozhena Antoniyar, also from Myanmar, is slated to face Malaysia’s Audreylaura “Ice Comet” Boniface.